Pork Liver Pate for sale. Buy online at Zingerman's Mail Order. Gourmet Gifts. Food Gifts. Pate from New York made with heritage pork. Even Heather Sanford, who makes this pate, acknowledges that it’s hard to make liver taste good. It takes a lot of work, a lot of care, and a very good recipe. But when she’s done, it’s not just good, it’s tremendous. 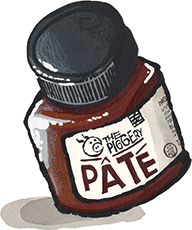 The pate is made with heritage-breed pork that Heather and her husband Brad raise on pasture at their farm in upstate New York, plus ingredients like local eggs, heavy cream, and a slew of savory spices like white pepper and nutmeg. It’s super silky smooth with a deep, earthy richness. Eat it on crostini or a slice of apple with something tart—a slather of real Dijon mustard would be great—and pickles for the best five-minute Thursday night dinner you’ve had in months.